There are many reasons to prune a tree. For example, a broken limb, such as the one in the photo above, should obviously be removed for safety's sake, but branches should also be removed if they are crossing each other, since repeated rubbing between windy branches could damage the bark, a tree's protection against disease. Trees also are often pruned to allow more light to reach planting beds or lawns below, or to remove branches that hang dangerously over property or electrical lines, or to cull branches with a weak junction to prevent future splitting. And finally, my personal favorite reason to prune trees is to allow the form and shape of the species to show through at its finest. In all of these cases, the best time to prune trees is when they are young, for then the branches are small and easily and safely handled by a homeowner. Pruning when they are young also allows you to direct the trees' growth and to head off future problems with weak or problematic branches. In general, prune a young tree to allow one or two leader branches (the main branches that are growing in an upward direction), and thin the lateral branches so that they are evenly spaced. Remove any branches that cross. The strongest junction between a branch and trunk falls roughly between 90 and 45 degree angles, and very narrow junctions (less than ~15 degrees) are considered weaker and possible candidates for early removal (this "rule" can depend on the species' growth habit). Another reason to prune trees when they are young is that you can remove more material during this period without harming the tree. For mature trees, it is best not to remove more than 25-30% of the tree's leaf crown, as it is more difficult for older trees to marshal the resources to repair many wounds. In the case of the two mature live oaks that recently required pruning, I removed far more material than I am normally comfortable doing in a single year, but my hand was forced by the damage that had occurred. Had I been more vigilant with my pruning in previous years, I might have been able to avoid the problems caused by the unusual ice storm. I am hopeful, though, that the trees will begin to recover in the spring with growth resumes. Which brings up another point. A tree surgeon once told me that the time of year to prune a tree is when the saw is sharp. In his case, I suspect that his motive was driven more by the need for monthly income than the health of the tree, for while you can prune nearly year-round, there are optimal times to do it. The most favorable time to prune is probably just before the spring growth flush (mid or late winter), because the tree will begin to produce healing tissue quickly once the growth flush starts. You can prune during summer and fall, but healing will occur more slowly. Spring is considered the least favorable time to prune, as by the time the growth flush is underway, the tree has already directed its energy toward putting out new growth and a leaf canopy, and will have less to spare for wound healing. If you cut too far out on the branch, you will leave a stub, making it difficult for the cork to grow over it and close the wound. So look for the bark ridge, see if you can identify an obvious collar, and then cut just a little beyond this. If the collar is not obvious, then look for the ridge, move out a little from that and cut at roughly a right angle to the branch. Before you make this cut, however, you have two other cuts to make, in the order shown in the diagram. Because you need the bark to grow over the wound, you want to take care not to damage it. If you were to cut a heavy branch all in one pass, the chances are very high that the limb will fall before you finish and rip some of the bark off the trunk. To avoid this, you first make an undercut some distance out from where the final cut will be. Then you cut the main part of the branch off a couple of inches in front of this. If the branch falls prematurely, it will prevent the tear in the bark from traveling all the way to the trunk. After these two preliminary cuts are made, you can then make the final cut. Cut #1 is made from below; cuts #2 and #3 are made from above, to avoid binding the saw as the branch begins to sag. 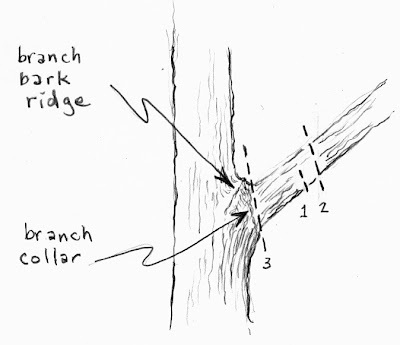 My experience has taught me that the three-part cut should be made on all branches larger than an inch in diameter, since the weight of even a small branch, especially if it still has all its leaves, can cause it to fall before the cut is complete and damage the bark. If the limb is very large, you probably want to take it down in sections anyway, as I suggested in yesterday's post. Even so, the last section should be not be too long, and treated as in the diagram above. On Monday, I will present Part Three of this pruning series, in which I will show some examples of good and bad pruning jobs. A fantastic follow-up, Susan. I look forward to the photo series. Thanks for the information. Up north I think of pruning trees (especially fruit trees) in February or March, no later. This will be very helpful as pruning time looms large on the horizon. WIldknits--What kind of fruit trees do you have? This post has a great deal of information and tips that gardeners, old and new will sure appreciate. Some people might think that a grown tree can withstand stress or damage but it might actually be harmed tremendously. This post will open minds so the public can understand how to deal with trees better. Thanks! Some garden or landscape owners still think that pruning of trees is merely cutting. This post gives proper information on how to prune a tree the correct way, allowing it to continue its life, thriving well in the landscape. This article is very good & informative.I have gain so much information from this blog.I like your blog.Thanks for the post.